I crawled groggily out of bed this morning and ambled out to the kitchen. My Beloved turned to me and said “I don’t know how many more State of the Unions I can handle.” Last night we listened to President Obama’s hour long speech, then Republican Savior-in-Training Senator Marco Rubio’s, followed by Congressman Rand Paul’s, as the voice of the Tea Party, which is the other white meat of the Republican party. Afterward, we smoked. The Designated Survivor One odd little factoid that was revealed during the pre-speech(es) buildup was that Energy Secretary Steven Chu was selected to skip this year’s address. 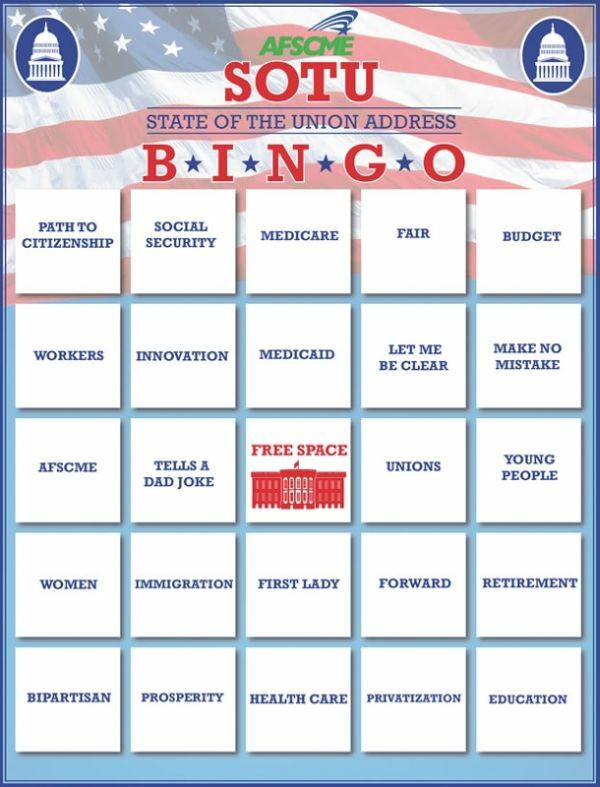 Because the president, vice president, lawmakers, Cabinet secretaries, Supreme Court justices and members of the military’s Joint Chiefs of Staff are all sitting together in a confined space in the Capitol, one Cabinet member is chosen to skip the speech every year. The concept of a designated survivor is an interesting one. Obama presented a blueprint of sorts about who the designated survivors of our great recession and current political obstructionism should be. He clearly designated all of the American people, not just the few, not just the people inside that chamber. He was talking to us right here in City Heights. Jobs. Jobs that pay a living wage. Jobs that provide equal pay for equal work. Legal benefits that apply equally to everyone, regardless of sexual orientation. Jobs that include paid sick leave and family leave. More jobs. The restoration of lost jobs (and services) in the public sector. Investment in public infrastructure- transit, sidewalks, street lights, safe roads, public education, alternative energy and the jobs that go with those investments. Quality affordable health care access for every man woman and child, and the quality jobs that level of access requires. Bring our troops home to a peacetime economy and jobs for every one of them. Keep our families united through legal residency opportunities and a path to citizenship for undocumented neighbors and kids. Jobs. And ending gun violence on our streets, in our neighborhoods. And jobs. President Obama was attuned to our City Heights checklist. That’s pretty much why we re-elected him this past November. What could possibly go wrong? It is not a good sign when the president has to repeatedly exhort Congress to actually vote upon and pass legislation, which is precisely what he did during his speech. He wasn’t even asking Congress to vote in any particular way. He was simply asking them to do their job, which means debating and creating legislation to keep our democracy and economy intact. This Congress and the Congress elected during Obama’s first term of office are legislative saboteurs– “Do Nothing Congress” is much too kind. When Mitch McConnell, Republican senate minority leader, announced within days of Obama’s election that his party’s number one job was to make Barack Obama a one term president, he wasn’t kidding. Republicans served up a fetid stew of procedural obstructionism, venomous partisanship and wingnut crazy. My neighbors and I don’t know diddly and couldn’t care diddly about filibusters, secret holds, manufactured debt ceiling crises, sequesters and fiscal cliffs Beltway style. We are smart enough to know however that those are not the products of an honest day’s work and those responsible for them are not worthy of an honest day’s wages. Where are the jobs and why isn’t Congress doing theirs? Republican Senator Marco Rubio, hoisted on his own petard?… When President Obama ended his speech, he affirmed that the American people accept that collectively we have certain obligations to each other. He affirmed that even if our elected representatives cannot solve every problem, they were elected to make a difference. Senator Marco Rubio was rarin’ to refute. There is an irony here about his use of the word opportunity. Marco Rubio’s family emigrated here from Cuba. He understands the opportunities provided by legal residency and a pathway to citizenship. He also knows that the Cuban community has benefited from a very special piece of legislation– i.e. from Washington– that granted legal status to Cubans who fled Communist Cuba. Special legal status benefits are still extended to Cubans who manage to make it to dry land. That is an “opportunity” not granted to Salvadorans, Guatemalans, Mexicans, or any other nationality to my knowledge. This opportunity-or lack, derives exclusively from the government. Rubio also alluded to his student loans and his parent’s Medicare and he presented them as necessary things. Now that’s odd; those are government programs. But while he assures viewers that his party would not mess with those who are currently receiving Medicare, he was not very forthcoming about his party’s plans (see Paul Ryan, zombie eyed granny starver) for subsequent generations. Rubio does want to grow the economy through a combination of mystical opportunity, a balanced federal budget amendment, and doing something about Obamacare (baaaad!). He also mentioned that he has concerns over evidence of a moral breakdown in the country. Yes, Senator Rubio, I am concerned about the moral breakdown too. Earlier in the day, Rubio was one of twenty- two male Republican Senators who voted against the Violence Against Women Act re-authorization. Senator Rubio gave his response in Spanish too, so I’ll give mine. Sr Rubio: Mucho ruido, poco nueces. Rand, Rand, Rand…. Yes, I watched Paul fils serve up a big heap o Reagan in his Tea Party response. “Government is the problem!” When Rand Paul repeated those words, they lacked the freshness of Saint Ronnie’s delivery, which I am old enough to remember well. And I also remember that the big government hating Reagan turned us into a debtor nation and that born again Reaganites like Rand Paul don’t want to remember that he raised taxes numerous times. But I digress. “Capitalism!” “Free Markets!” “Growth, jobs, prosperity!” Paul delivered up bumper sticker quality mainstream Republican thought. But the Tea Party darling asserted his extreme right wing cred when he issued the warning that if Congress is unwilling to clean up its act, they will “sweep the place clean.” Sinners be warned- you are in the hands of an angry Aqua Buddha and the purging will begin. Our evening civics lesson was over. It wasn’t too late to put on some Brazilian carnival music and dance during the last hours of Mardi Gras. The word carnival is rooted in the Latin words for “goodbye to the flesh.” It refers to the Catholic prohibition of eating meat during Lent. The Republican/Tea Party response to the State of the Union address last night referred to spending cuts and deficit reductions. Neither Rubio nor Rand used the terms “shared sacrifice” or “skin in the game.” They didn’t have to– the whiff of Lent was unmistakably in the air. Call it austerity. And here in City Heights we understand what it means to say “goodbye to the flesh,” to be faced with the end of good times, and to turn to prayer as the perhaps the last resort– for jobs. 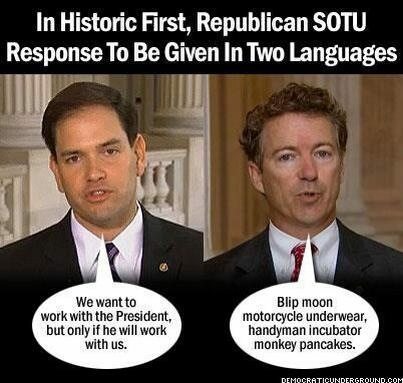 Rubio is a contradiction in terms. He rails against big government and then volunteers the information that his family has profited greatly from government programs. The Republican rhetoric about big government is getting a little tiresome after 30 years. The Republican approach to government is to use it as a funnel for taxpayer money directed to large corporations and then to privatize everything so government is reduced to a funder of private enterprise. That way government is as small as possible because it doesn’ t do anything except transfer money from the poor and middle class to the rich and large corporations. You are right John. The Republicans chose a new messenger in Rubio to deliver the same 30 year old message. The American public clearly rejected that message. The Republican party had 5 seconds worth of soul searching after their defeats in November. LA Governor Bobby Jindal said it was time for Republicans to stop being the party of stupid. If stupid is doing the same thing over and over again and expecting different results….what can I say? Well John: That’s what the Republicans are all about…duplicity and more duplicity. Is not that they are against government. They are against and afraid of a government of the people and for the people. Ramón- Vecino mío, thanks so much for weighing in. I hope that we hear much, mucho más, more from you! HOwdy, amigo! Good to hear from you. Ooops, I spelled my handle wrong. Not had my morning coffee yet. Well I know one thing as a Federal employee. I have to resign myself to acceptance that at a minimum there will be one day a week furloughs likely coming. That will be a 20% pay cut, and I’m only a GS5. Eventually there’s a very high chance it will be actual layoffs. Because I’m in civil service for the Department Of Defense I don’t get a lot of sympathy from people on either side of the political spectrum. Conservatives who are all about slashing government are more than happy what will more than likely happen to people in my situation. My fellow liberals aren’t all that sympathetic to people in my situation either because we profit off of the “military industrial complex”. Guess now would be a good time to go to Bartending School. Goatskull- are the cuts you talk about associated with the sequester going into effect? The sequester is another example of manufactured misery. Yep. Kind of a tough pill to swallow knowing it’s manufactured misery and all you can do is bend over and take it. Rumor has it that Wally World in all their compassion and sympathy for the American worker will be offering part time jobs to furloughed DoD employees on their day off. Cheer up, Goatskull. There should be jobs coming online if the government ever gets around to replacing military-industrial complex jobs with infrastructure-industrial complex jobs. That is if we go from a permanent wartime economy to a permanent peacetime economy. But don’t hold your breath. Maybe bartending school isn’t such a bad idea. I definitely won’t hold my breath. The bartending thing was just sort of a joke as to what I’d do on furlough Fridays (tho maybe not such a bad idea). IF we ultimately DO get laid off I’ll have to do what everyone else does and hit the pavement looking for something else. There was very little in the State of the Union about the state of the union. It would have been too much to expect an Obama to talk candidly about the separations purposefully carved out between men and women, young and old, teachers and management, elected liberals and humanity… Republicans and decency… and how it has dismantled the union. Is it a corporate state of non-union? Probably. At least a well-educated man like Obama might have spoken about the distance between our leaders’ words and the reality felt by the led, and what happens under conditions like these, and what must be done to overcome paralysis. He could have. He didn’t. Now, let’s go to the Park and be among One Billion Rising, tonight. And keep the pressure up. Damn! I thought it was ‘steak of the union’ and kept waiting for him to introduce the new National Steak and BBQ Sauce.